Great for lasting through the winter into spring, autumn hanging baskets add a dash of cheerful colour to those darker autumn days. We have a fantastic selection of colourful hanging baskets to choose from. Our autumn hanging baskets generally start to come into flower from late September onwards. 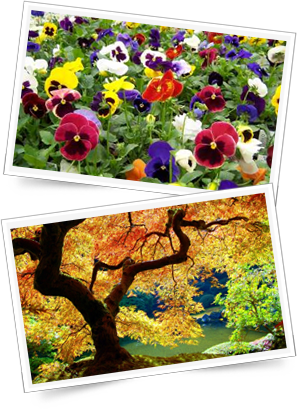 October and November are good months for planting out your pansies and putting up your winter hanging baskets. Come visit our nursery in Solihull (near Birmingham) and buy or hire from our hanging basket selection this autumn! What plants are available in Autumn? Pansies, Violas, Primroses, Polyanthus, Cyclamen, Trailing Ivies and other hanging basket plants are all available in autumn from our nursery. If you, or your business wants to keep your autumn hanging baskets fresh throughout the season, please ask us about our hanging basket hire program.